In traditional belief, the native Gabrielino-Tongva people of the Los Angeles basin first come to be in the sacred ancestral village of Povuu’ngna located on and around the Rancho Los Alamitos hilltop. The site remains a sacred place for all Tongva today. "The Creation of Man" by Jean Goodwin, from Chinigchinich, by Father Geronimo Boscana. 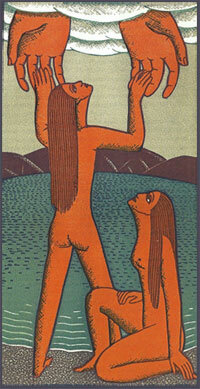 In one telling of the creation story, Chinigchinich creates man and woman from clay found at the borders of a lake. The Tongva people today are their descendants. 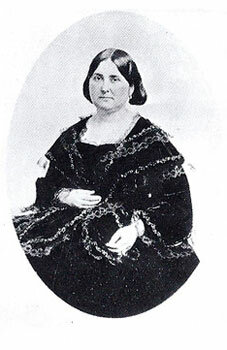 Arcadia Bandini Stearns was married to 43-year-old Abel Stearns when she was 14 in 1841. 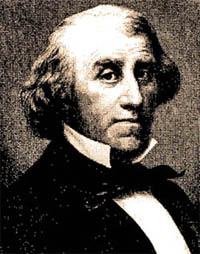 Abel Stearns, a civic and social leader in Los Angeles, purchased Rancho Los Alamitos from the estate of José Figueroa in 1842. Rancho Los Alamitos: Ever Changing, Always the Same by Claudia Jurmain, David Lavender, and Larry L. Meyer was published in 2011. José Manuel Perez Nieto receives the original 300,000-acre Los Coyotes land-use permit from the Spanish Crown for his service on the Gaspar de Portolá expedition. Nieto’s land is reduced to 167,000 acres following a dispute with Mission San Gabriel, still the largest award given by Spain or Mexico in California. Nieto siblings, who inherited the land, receive title and permission to divide Los Coyotes into five great ranchos. José Manuel’s oldest son, Juan José, sells his 28,500-acre Rancho Los Alamitos to Governor José Figueroa for $500. Abel Stearns, a civic and social leader in Los Angeles, purchases Rancho Los Alamitos from the estate of José Figueroa. The deed of sale dated July 12, 1842, states that Stearns paid $1,500 for the six leagues of land, several adobes, and livestock. Stearns loses vast numbers of his cattle to the severe floods and droughts throughout the early 1860s. In 1865 Rancho Los Alamitos is foreclosed. Hailing from Maine, John William Bixby, wife Susan Hathaway Bixby, and their young son, Fred, move to the Alamitos hilltop where hired hands help them repair the dilapidated adobe home. John Bixby and two partners purchase Rancho Los Alamitos for $125,000. Over the next few years the Alamitos partners begin developing 5,000 of the 26,393-acre ranch into the Alamitos town site by the ocean with farm lots further out. John Bixby dies. Each of his partners receives 7,200 acres while his heirs receive the central portion, house and barns, and the rancho name. Susan Bixby dies. John’s son Fred Bixby, his wife Florence, and their children, move into the Ranch house at Alamitos. Fred Bixby and his sister Susanna partition the jointly inherited property. Rancho Los Alamitos is now 3,600 acres. 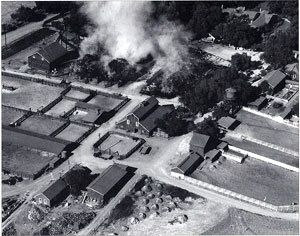 The Signal Hill oil strike occurs on land leased from the Alamitos Land Company. The discovery of oil ushers in the city's oil heritage and makes Fred Bixby a wealthy man. Florence Bixby hires landscape designer Florence Yoch of Pasadena to create the formal Geranium Walk. Florence Bixby hires the renowned Olmsted Brothers Firm to design a series of small gardens. These include the Secret Garden; Rose Garden, Olive Patio, Oleander Walk, Cutting Garden, Jacaranda Walk, and Friendly Garden. Fred Bixby puts 148 acres, the Ranch house at their heart, under an umbrella he names The Home Property Trust. A fire destroys the Ranch’s iconic big red barn, a landmark for 70 years; most of the adjacent corrals, barns and a shed are badly damaged. A smaller Horse Barn is built which is part of the Rancho Center today. The Bixby heirs deed the 7.5 surviving acres of Rancho Los Alamitos to the City of Long Beach. Rancho Los Alamitos is listed on the National Register of Historic Places. The City of Long Beach partners with the Rancho Los Alamitos Foundation to develop the educational potential of the site and manage and preserve Rancho Los Alamitos Historic Ranch & Gardens. The Foundation prepares a nationally recognized comprehensive Master Plan for the site. Footprints on the Land, tour concept and docent training manual, wins the American Association for State and Local History national Award of Merit. Planting Perspectives, Native and Newcomer on the Rancho Los Alamitos Landscape is published by the Rancho Los Alamitos Foundation. O, My Ancestor: Recognition and Renewal for the Gabrielino–Tongva People of the Los Angeles Area is published by Heyday (Berkeley, CA) and receives the American Association for State and Local History national Award of Merit. Rancho Los Alamitos Foundation celebrates its 25 years existence and partnership with the City of Long Beach. Rancho Los Alamitos: Ever Changing, Always the Same is published by Heyday (Berkeley, CA).